Opened August 1, 2016, Cloud Nine is a 2900 sq. ft. newly constructed home on a corner lot, featuring 1200 sq. ft. of additional outdoor living space. 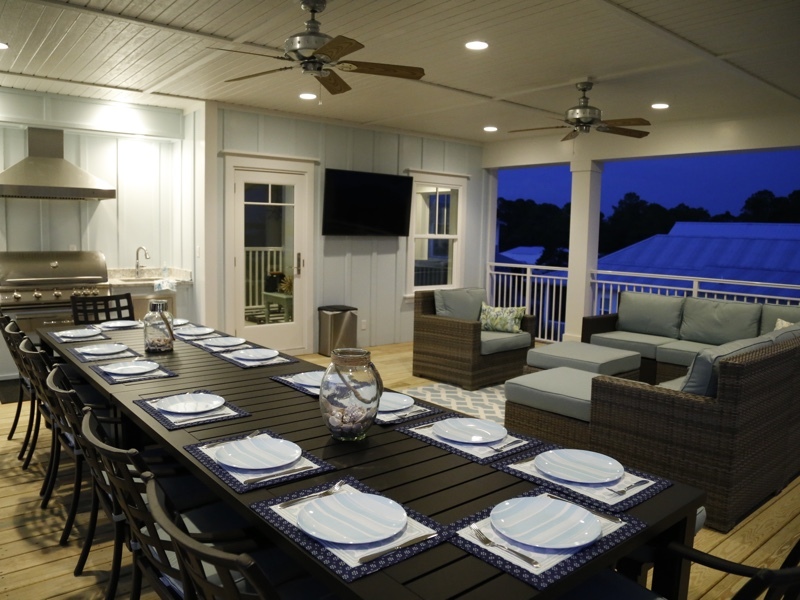 The third floor outdoor kitchen and dining/living space is one of the largest in Seacrest Beach at 500 sq. ft., with a beautiful view down palm-lined Seacrest Beach Boulevard. Cloud Nine is a professionally decorated, three story home with five bedrooms and four and a half baths, perfect for a three family rental. It sleeps and feeds 16 comfortably. With a first floor living room, third floor recreation room, and the third floor outdoor living area, there is plenty of room for everyone to spread out. Large flat screen 4K UHD wall-mounted TVs are in the living room, recreation room, and third floor outdoor living area. All five bedrooms are equipped with wall-mounted 32” HD Smart TVs. The fully equipped kitchen features sequoia quartzite counters. Stainless steel Kitchen-Aid appliances include an oversized French-door refrigerator, dishwasher, down-draft gas range, built-in microwave and a 50 lb./day icemaker to get the coolers ready for the beach! Table linens, dishes, utensils, and glassware for 16 are provided. The dining room table seats 8, with room for 4 at the island, and 4 more on the front porch. Of course all of the small appliances needed are provided as well: a 4 slice toaster, coffee maker, mixer, and heavy duty blender! A full sized washer and dryer are located in the first floor laundry closet. The rear entry of the home (closest to pool and beach), features a cubbie storage area for your beach bags and shoes. We have provided 8 beach towels for your use. In the outdoor storage, you will find a small cooler, beach toys, two beach chairs, and an umbrella. The outdoor shower is conveniently located next to the outdoor storage to rinse the sand off of everything, and everyone. Third floor 500 sq foot covered porch features a summer kitchen with dining table to seat 16. The outdoor living area has a large sectional and smart TV, perfect for an evening of board games, movies or watching your favorite sporting event.